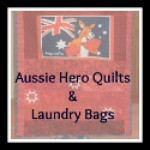 I am a quilt artist living in Australia. I'm a quilt designer and proud wife of a Vietnam Veteran. I have just finished my Bowls with Borders quilt for the blog hop of the same name (see previous post). All I have to do now is to quilt it and sew a label on the back. I haven't as yet thought of a name for the quilt but was thinking of something along the lines of "Bowl 'Em". If anyone has any suggestions for names for the quilt, feel free to suggest them in the Comments section at the end of this post. I won't get a chance to make the label before Tuesday, since now the quilt is finished, the dreaded housework has to be done! Here's a photo of my finished quilt, albeit taken just 30 minutes ago at 11.10pm and on my mobile (cell phone) so it's not the best! Please forgive the darkness on the right-hand side of the photo as it is taken in my dining room and the light is not the best there. No matter how many times DH (dear husband) replaces the downlight near my sewing machine (I sew on my dining room table), it always goes out or is dim. I haven't worked so late on a quilt in ages, mostly because I am normally relaxing in front of the television at this time of night or because of the poor light above my sewing machine in the dining room. Now I will get back to the subject of my quilt! The story behind the quilt is that I mentioned that I was taking part in this blog to some friends. When I mentioned the bowls theme, one of them thought that it would have something to do with lawn bowls because my husband plays the game and I am Secretary of our local Social Bowls Club (I don’t play though). So I thought it would be fun to incorporate the two. The quilt is a bit quirky (and that's me all over) so I must admit to being reasonably happy with how it turned out. It is my dear husband’s hand that is holding the lawn bowl and is about to bowl the bowls. If you look carefully at the lawn bowl, it is one of Barry’s new set of bowls, designed by him. They are purple (our signature colour) and of course, feature a Bundy bear (logo of Bundaberg rum which is the only alcohol that Barry drinks and he is “famous” for loving his Bundy. We also collect Bundaberg Rum merchandise, like mirrors, bar mats etc. Last night I had done most of the appliqiue completed (except for the yellow bowls) and yet the quilt still looked like it needed something, like a point of reference, so I appliqued the shelf on. 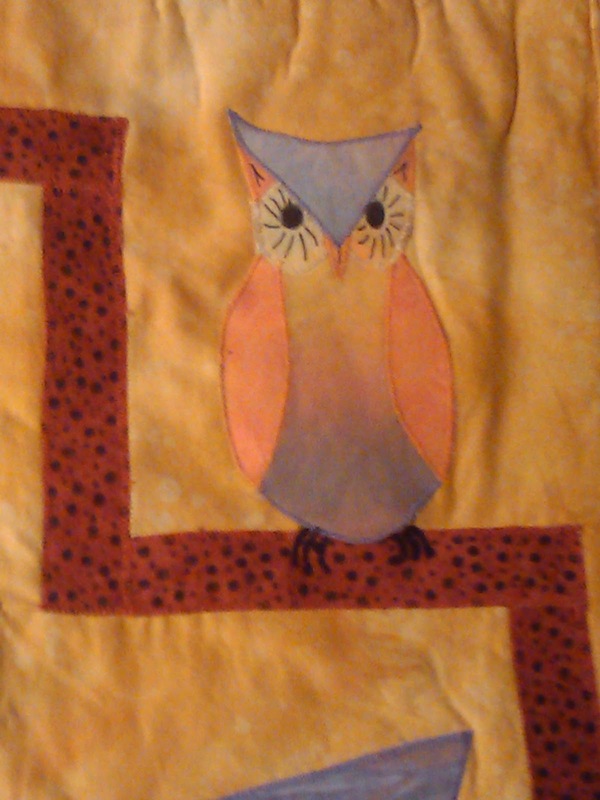 I then sewed on the cupboard (I like the asymmetrical shape of it), and the shelf of course needed some still life on it, hence the owl. The owl is actually a photo of one that I drew then appliqued on the chair quilt that I am making for myself. I figured rather than go searching for a photo of an owl, why not take one of this owl, so I did. I do so like my little owl who I think I will name either Ollie or Owliver. Thnak-you so much to Carol for organising this blog hop. I wanted to take part because I liked the idea of a bowls quilt and had been thinking about making myself a kitchen quilt. I will hang this quilt on the door between the kitchen and the laundry (the laundry opens off of kitchen) so this quilt is just perfect. I mentioned earlier that purple is the signature colour of my husband Barry and I. I have loved purple ever since having a crush on Donny Osmond when I was 11 or 12 and purple was Donny Osmond's favourite colour, so it became, and stayed, mine too! Luckily for me, DH also loves purple and we own a purple trike (3-wheeled motorcycle, in our case, a Raewaco trike) and we have owned a purple car. So that is why I chose to have purple and yellow bowls in this quilt. The purple and blue fabrics were all scraps left over from the quilt that I was working on (the one in which Ollie/Owliver features) so I thought that I would use them in this quilt. I am so enjoying everyone's interpretations on this theme. I have chosen to make my blocks in applique as this is my preferred method to paper-piecing, although I do use that method for blocks such as New York Beauty blocks where that technique really comes in handy. Thanks to Carol and Regina who were happy for me to applique my bowls. I love brightly coloured crockery and that is all I buy, for my husband I. To me, bright colours bring happiness and life to a home. I must admit that this day was easy for me to remember for my reveal, because it was my (dear departed) German grandfather's birthday, which falls exactly a week after my own. I so loved my dear German grandfather, so it is fitting that I reveal something of my creation on this day. A lot of personal touches to make your little bowl quilt all your own. thank you for sharing. I like your cupboard of pretty bowls. They are very colorful and the Owl is a creative addition. Bern, your developed your idea until it became a very personal und fun quilt - well done! Altering my pattern is fine - and I love the mix of pp and appliqué. You put a lot of thought and work into your bowls, and I like the owl a lot. Glad to hear there are other purple nuts people out there! I was beginning to feel like a true minority! I love the quilt and I loved reading the story behind it. Happy belated birthday! WOW! When I think I have seen all the possibilities of this pattern, you really know how to surprise me! How great you combine your daily live with the lovely bowls of Regina, and you dare to pile up and play with the pattern. I love your kitchen quilt! Great bowls! and I love the asymmetric shape of your hanging! the addition of the owl is perfect! Great idea and the owl is such a sweet addition! This is a really successful conversion in form and coloration and applied owl. Good work! Thank you so much for sharing your lovely bowls! I am loving seeing all the wonderful work everyone has produced. Great bowls, great fabric colors. So much thought put into your project. Thanks for being part of the hop! Your quilt is adorable and awesome. And the added owl and the hand with the bowl is very creative. Thank-you all so much for your lovely comments. It's reassuring when you design something and feel good about it (well relatively good ... because we are all our own harshest critics ...) and then other people compliment you. So people's comments are helping me feel like I have "hit the mark" so to speak. I haven't studied design since high school (I'm now 49) but have picked up a few design concepts along the way, which I try to incorporate into my quilts. I still have so much to learn though! Dankeschön, Gabi! I originally typed Danke schön but thought I had better check my memory of my high school German and the German-English dictionary has those two words are one word. Wicked may be a consideration with your love for owls...that is a great one with a moon.. Cute, cute and I love the story that goes along with your quilt. Thanks for sharing. I love your bowls and all the personal touches in your quilt. I also love your dog in your blog header. 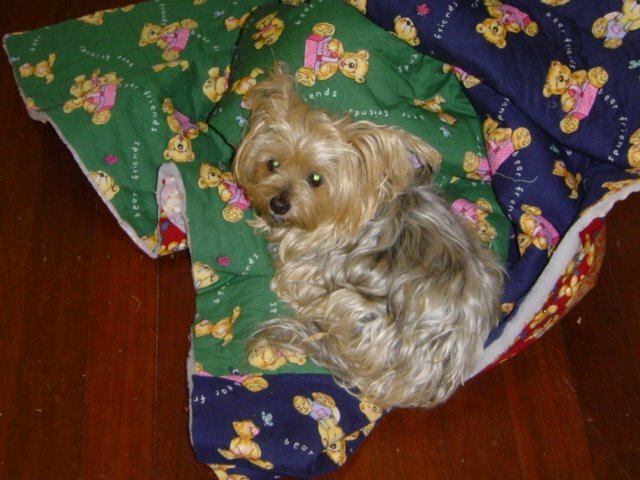 We own a Yorkshire terrier who looks very similar and loves to curl up on my fabric or finished quilts. Great job. Love your idea with the owl. love your display....so many lovely bowls...and your applique adds so nicely to it. Bowling Whoo! Love the wall hanging. A very creative version of the bowls , great job and thanks for sharing. Great idea to make it your own. Love the idea of a kitchen quilt. You quilt is fantastic! I love the applique work you did. The owl is adorable. I love the design and the fabrics you chose, really well done! How cute! I love the owl! The purple bowls are wonderful! You did a great job on this! OMG.... when I first saw the quilt I thought the "hand" was someone on the side holding a ball to bowl the bowls with just for the fun of the picture... then I relly looked and saw it was part of the quilt.... JUst toooo neat! Great idea!!! I like your bowls and the owl!! Your quilt bowls is very nice and love the owl you added,fantastic!! Beautiful bowls and love the addition of the owl! When I first saw the picture I wondered about the hand....until I read about it...how fun! Beautiful work. I love the owl. Thanks for sharing. Your wallhanging is wonderful. I loved your story of making it and that it is all for you! Thanks for the humorous story that accompanies your bowls with borders and that wonderful owl is great. Very well done wall hanging! It looks like a winner to me also. I love your bowls!!! 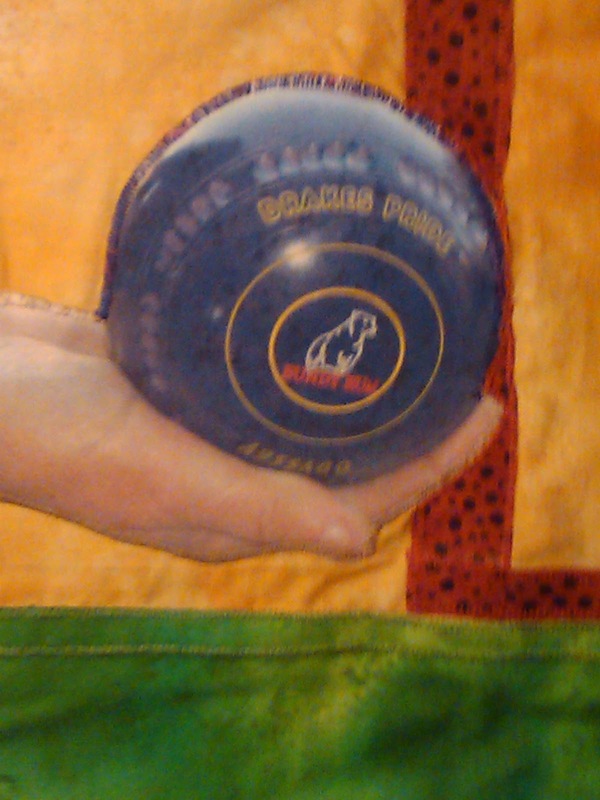 Of course, purple is one of my favorite colors too AND the lawn bowls ball reminds me of giving that sport a try when I was visiting friends n Perth!!! Thank you for sharing your Bowls Bowls with us!!! I love your bowl creation. You could call it b-owls! Very colorful! It is such fun to incorporate family ties/thoughts/memories into our quilting. Sometimes the story becomes the highlight. Love your creative use of the pattern and of course, that you added the owl and your husbands bowling hand. Here are a couple of ideas for the quilt's name: Bundy Bowls or Whooo Bowls? I love the sense of humor that you displayed in your quilt. Nice job. 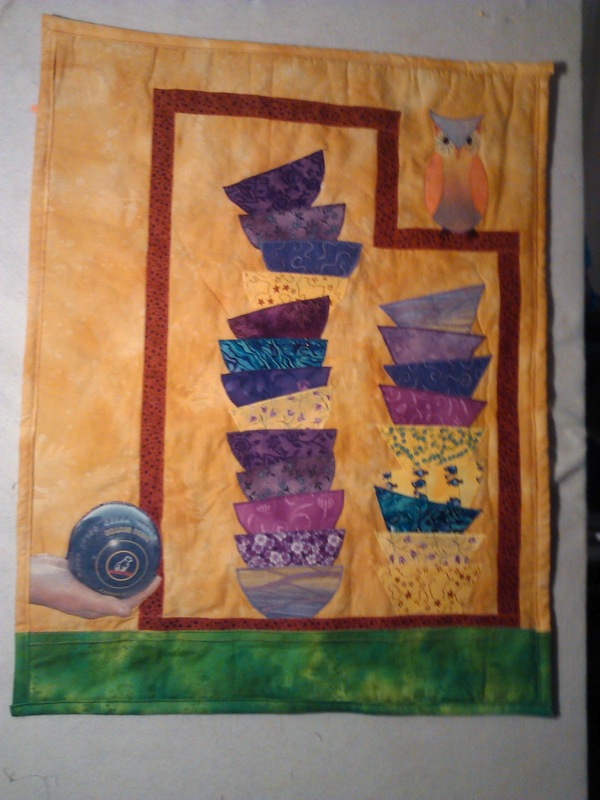 Clever to incorporate your trademark color, lawn bowl activity and the stacks of bowls together in your little quilt! Great thinking! This is an incredible adaptation of this pattern! Oh, I really like your wobbly stack! That owl is adorable! What a creative interpretation! I love the purple with the yellows and gold! Beautiful! Thanks for sharing the story behind the quilt! I love the colors, but I sure feel sorry for that cute innocent-looking owl, for he has no idea the crash and breakage that is coming soon! Love the 2 stacks of bowls in the cupboard. The owl is a cute touch. Nice job. Thanks for sharing. I like your colour choices and unique design. Thanks for sharing it. What a fun quilt and it has special meaning for you. I like the owl. Amazing how fast we can finish when pushed for time. Great quilt. I love the owl and hand/bowl. You really managed to make it your own. I love your artsy take on the project and the personalization that you gave it. Wonderful job! Very creative....sure loving that owl. The Owl is a cute touch. Happy belated birthday to you. Your bowls are so cute. Love the owl. Good job Bern...a well thought plan for your quilt. The owl is a hoot!! Thanks for sharing!! Two stack side by side, what a great idea! I have been a quilter and quilt artist for many years. I am married to a wonderful Vietnam Veteran. My blog details my quilts, our involvement in the ex-service community and our interests, including dog-minding and our community work.